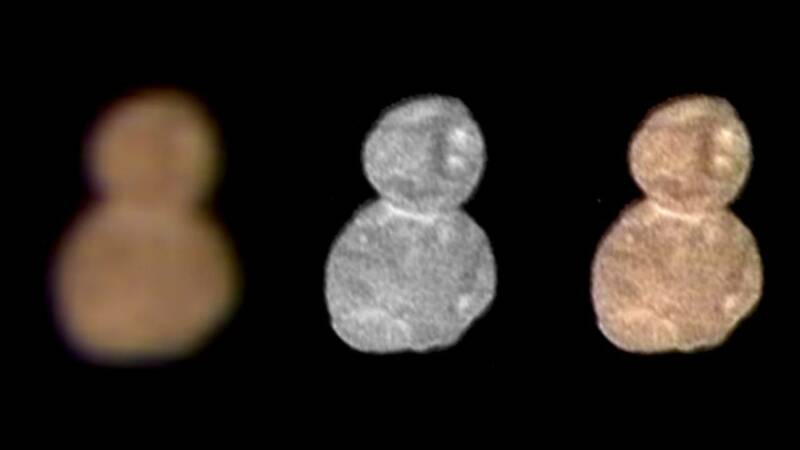 On Tuesday, the first image of the Kuiper Belt object Ultima Thule taken by the New Horizons spacecraft revealed a bowling pin. On Wednesday, more distinct and color images revealed a snowman. CAPE CANAVERAL, Fla. - The faraway space snowman visited by NASA last month has a flat - not round - behind. New photos from the New Horizons spacecraft offer a new perspective on the small cosmic body 4 billion miles (6.4 billion kilometers) away. Scientists say the two-lobed object, nicknamed Ultima Thule, is actually flatter on the backside than originally thought. Pictures released late last week - taken shortly after closest approach on New Year's Day - provide an outline of the side not illuminated by the sun.